After 8 years of being in RC hobby I recently branched out and started the photography hobby. I bought a DSLR (Canon T1i) and a good lens (Canon EF 24-70 f/2.8). The lens doesn't have the length for RC airplanes, but it's a good lens for up-close pictures in the pit area. I would like to start a thread where amateur (and pro) photographers can share their best pictures related to anything RC (airplanes, helis, cars, boats). When I first started at my club(s) I spent far more time taking pictures than flying. That may have been because my picture taking abilities far exceeded my flying ability. I produced a ton of 4 x 6 pix ( for about 20 cents each at Wal-mart) and posted them on the club bulletin boards. The guys seemed to like having their planes featured. One small hint on the shot with the orange fence in the way. You can press your lens right up against plastic and metal fences and get a full (( or nearly full) frame shot. I've shot lots of baseball games with my lens squeezed tight to the chain-link fence. It is a good reason to use a filter of some kind over your expensive lens, of course. I shoot a Sony A350 with a Sony 28-250 lens. Seems to cover all my needs. No lens to change..hardly ever. 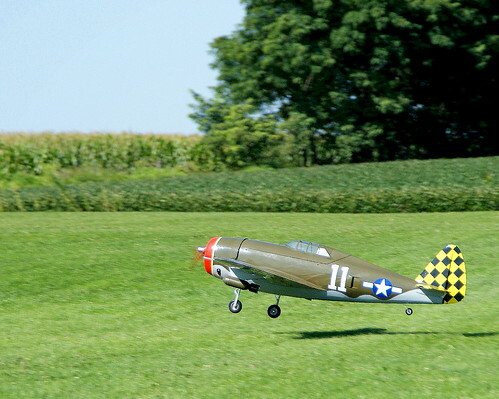 The P-47 ( six foot wing-span) shot shown below was published in a local free paper. I'll be back later when I'm not at work, and can access some of my shots. However, in the mean time, couple of thoughts on lenses, per your comment about not having the right length for RC. First, don't sell yourself short. A couple of those are really fantastic shots. Specifically, #1 top row, and #2 second row especially. There's no rule ANYWHERE that says you have to reach out and pull in an airplane in flight with some magical long lens. Heck...there pretty much aren't ANY rules, to be honest. Considering the two photos i mentioned...let's remember, this hobby is NOT just about airplanes. heck, for a lot of us, the airplanes are really just the EXCUSE for getting together and playing a spirited game of "First fibber don't stand a chance". 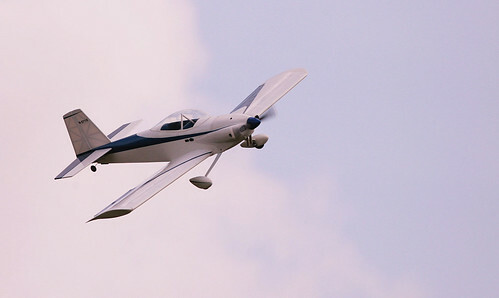 This hobby is, for a lot of us, as much or more about the PEOPLE as it is the airplane. Pictures like those two capture an element that is missing in SOOOOO many RC photos. Without meaning to be critical of your SKILLS, consider the composition of the fourth picture, top row...the one of the ultimate. Bluntly...whee. It's a biplane...in the air. Yay. Again...I'm not criticizing your skill and shooting the picture in any way...but for ME (and ALL of this is simply a matter of personal preference), that's a non-starter of a picture. it's just an airplane in the air. I can't tell how high or low it is...I can't tell how big it is...I can't tell if there's anything unique about it or f it's "just another ARF"...or anything. beyond the fact that it's flying...and anything that flies is cool...the picture leave me completely "meh". So...consider this. For at least ONE person here...the lens you've got is FINE...for a particular type of shot. I LOVE the two photos I mention above precisely BECAUSE there's some sort of context to them...context you simply could NOT get with a longer lens. What some may have seen as a "limitation"...the shorter lens...in those cases was a STRENGTH...it allowed you to get that close, and still retain the depth of field necessary to create the whole moment. Is my opinion right or wrong? Absolutely not..it's just an opinion. Photography...and indeed our love of this hobby...is SO subjective. Just like you might love or hate my airplanes, and i yours...others may love or hate various pictures that show up on this thread. So be it. Ultimately, the photos ARE just like our airplanes...if we have fun creating and sharing them...then who CARES whether others like them? Having said all that, as an avid canon fan and owner myself, let me rcommend a couple of lenses if you ARE looking for longer stuff. Canon makes a darn fine [link=http://www.amazon.com/Canon-55-250mm-4-0-5-6-Telephoto-Digital/dp/B0011NVMO8/ref=pd_cp_p_2/181-3201245-8934764]55mm-250mm lens[/link] that you can usually find for < $300. It's not "pro grade" optics by any chance, but it is a TERRIFIC lens for shooting RC imo. It'll reach out and grab airplanes from a gooddistance away, with considerable detail. a little experimentation with camera settings will let you do some really nice work, stopping airplanes but maintaining prop arcs, etc. It also happens to be a pretty decent lens for hobby-level sports photography, even for indoor events like NHL hockey. If you have the budget, canon also makes a darn fine [link=http://www.amazon.com/Canon-70-300mm-4-5-6-Lens-Cameras/dp/B0007Y794O]70mm-300mm with IS[/link]. This, imo, is probably THE most "bang for the buck" lens on the market for sports/aviation photography, and happens to be my long lens of choice. For consumer level canon-compatible lenses, imo, it can't be beat. Paul Bonhomme at > 200 kts, on a cloudy overcast day, at a range of about 200 yards. It is a PHENOMENAL lens. Finally, certainly some pricetags can scare you...ESPECIALLY if you don't know whether you and the lens are going to get along. So...allow me to HIGHLY recommend [link=http://www.lensrentals.com/]lensrentals.com[/link]. INCREDIBLE service, top notch equipment, and VERY reasonable prices. As an example, you can rent the 400mm gem above for a whole WEEK for < $100, shipping included. I've done business with them multiple times (in fact, the pic above was shot with one of their lenses) and can NOT say enough good things about them. They offer a FANTASTIC way to try a lens before you buy, or, if you want a certain lens for a special RC event, but don't want to spring to buy it. Anywho, as i say...when I get back home, and can access a few shots, i'll be back to share. In the mean time, GREAT thread, can't wait to participate! Yay..back where I have some access. Please forgive the inclusion of another full-scale photo...it just happens to be one of my faves, and I felt like showing it off. How did you take the last one? To Rich: Regarding heli from behind the orange fence... I intentionally shot it that way trying to be "artistic", but in all honesty helicopters scare me. HEHE. To gboulton: I totally agree with everything you say about the short lens. I'm limited to the pit area, and following people around as they recover their plane from a crash. But it captures the personal side of the hobby. And again, I agree it captures a side of the hobby that you rarely see in good photography. I think the people at my club like it when I take pictures of them. I say this because they ask for full resolution copies to print out. (btw... the picture of the Ultimate is really about the clouds in the background. The details are much more impressive at full resolution on my big monitor at home). Here's some photos of Jack just after passing his wings test. See how happy he is? (No "AIRPLANE PILOT" badges left, so he got a "HELICOPTER PILOT" one temporarily). The camera was not airborne. That end of the field is slightly elevated. It's actually on the other side of the fence you see in the second last picture. Nice pictures guys. I especially like the one with the heli and all the smoke. I especially like the one with the heli and all the smoke. That has long been one of my favorites as well. Thanks!! OK last one for now. This shot, and the one right above...were taken with a Canon S3 Ultra Zoom. 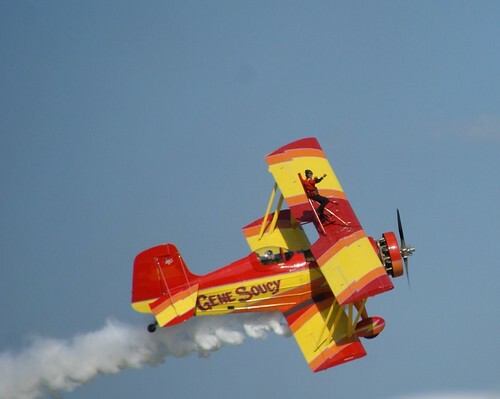 Snapped this one at the EAA air show at Oshkosh in 2008. Nothing like an air show to give you photo ops...huh?? If my photo host will ever come back to life (if it ain't one thing it's another), with juice's kind permission to "steal" his rc thread...I'll respond in kind. ... with juice's kind permission to ''steal'' his rc thread...I'll respond in kind. By all means, take the thread. I've already posted all the good RC photo's I've taken. It's up to you guys now. 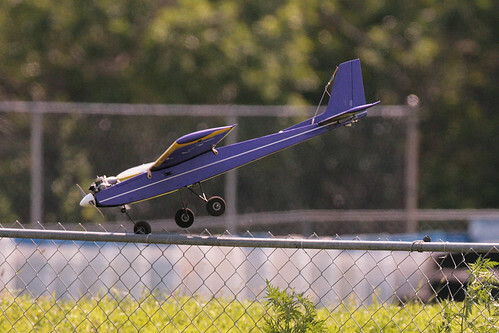 If possible, I'd like this thread to steer more towards creative photography with the subject always relating to anything RC (and full-size aviation, I like airplanes). By all means, take the thread. We'll start with a couple of the master, Jim LeRoy, may he RIP. Not the best technical photos I ever shot...early in the hobby for me, low end equipment. MQY, the airport right behind my house (literally...we share a property line) has an airshow every few years. Spent all WEEK watching the Angels practice, trying to get the timing right for this one...finally nailed it on a MISERABLY cold, rainy, overcast Sunday. http://public.fotki.com/BluesConvert/airplanes/ has more, if anyone cares. This was taken with a Sony HDR-FX1000 HD Video Camera using a high shutter speed. When I imported it onto the computer I can go thru frame by frame and save as a stand alone image what I want to keep as a picture. This is my ShockJet on finals about 5 seconds from touchdown. Love the heat waves from the engine out back. You do GORGEOUS work, sir. Kudos. Very nice everybody. Sure shows what marrying photography and planes can produce. Excellent shots all around. Since I've learned how to keep my planes in the air longer, I take far fewer pictures at the field. The trick is to shoot them on the ground with the right...er...accessories. The airplane is my scratch built 33% tribute to Jim LeRoy. Jim became a good friend during its build, and the plan had been for him to fly it not long after its completion. Sadly, Jim died the very week the airplane made its maiden flight. It's not the best build ever (only my third build, first ever from scratch)...but she flies well, and is, for obvious reasons, my pride and joy. The young lady is a local model of my acquaintance. There's several more of her running around on the same site I linked earlier, in other sections.